Tristan Lennox is a man with a hard shell. He’s had to perfect the art of detachment when he’s been plagued with disappointment his entire life. When he holds a contest challenging anyone to prove the existence of magic, he’s utterly shocked, SHOCKED I tell you, when a woman dressed in puritanical garb comes crash landing at his feet while straddling a broom. Arian Whitewood has been raised to believe that she is a white witch, which spells trouble for her when her neighbors in their small Massachusetts settlement in 1689 accuse her of cavorting with demons. Arian has only ever been able to pull off small parlor tricks, and only while clutching the emerald amulet given to her by her now-deceased mother. When she is accused of witchcraft and thrown into a lake to be tried as such, she clutches the amulet to her closely and miraculously finds herself propelled into the sky on a broom and toward the strange sigh of 1990’s New York City. When she crashes into Tristan Lennox’s public contest, the world is astounded. No more so then Tristan. He reluctantly offers her a place to…er…crash…while his lab examines her broom and clothing to figure out how, exactly, she did what she did. Arian, meanwhile, is completely in shock at her surroundings. It makes for some pretty hilarious conversations. Time traveling stories can be tricky, but pro Teresa Medeiros handles it with ease. 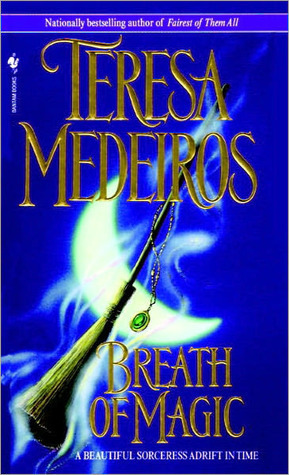 Breath of Magic is a fantastic, romantic love story about one jaded man with everything and nothing who finds what he needs in a woman that would never have gotten to him if not for his own now-dormant belief in the impossible. I giggled and swooned with this story. I’d highly recommend it if you’re looking for a fulfilling time traveling tale that’s guaranteed to bring a smile to your face.